As the readership of this blog grows, I feel an obligation to continue writing encouragement. Not the false encouragement you find from people who just look at the world with rose colored glasses, but true encouragement. I want to write from a place of honesty, a place that knows life's hardest valleys, and has been to the top of the mountain of joy. And I want to share that with you who read here. So much of my life's work with teenagers and faith comes from a viewpoint of problematic ladders of solution, while there is so much to be encouraged about today. There are so many teenagers that are working to try and find out the gifts God gave them, and how they can engage those gifts with the rest of the world. There are so many churches who really care about the intricate spiritual lives being orchestrated between family life, school life, and entertainment. There are so many incredible mentors out there who are giving their lives to make sure the next generation has a chance. And to those of you on this train….Be Encouraged Today! As you start your Friday, and on into the weekend, Remember…. 2. 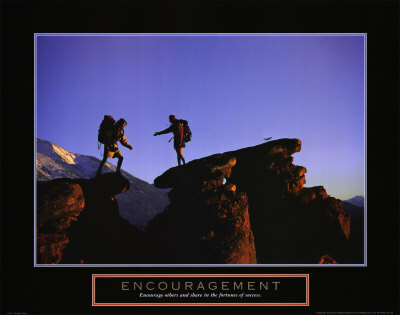 Encouragement to each other goes a long, long way. Reach out and notice somebody this weekend. I find that when I focus my day on helping to encourage others in their work, my own world seems brighter, and my spirit is full. May God bless you on this Encouragement Friday! I am thanking God for giving you the words to post. I needed to read this.